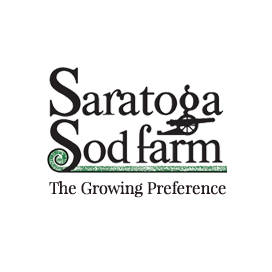 Saratoga Sod Farm is located in eastern Saratoga County on US Route 4 along the Hudson River between Stillwater and Schuylerville. The office is 2.5 miles north of the Stillwater High School and 1 mile south of the Saratoga National Historical Park entrance. From Albany and Points South: I-87 north to Exit 9 at Clifton Park. Right onto Route 146 East, 6 miles to Mechanicville. Route 146 ends at the light at the bottom of the hill in Mechanicville. Go through the light, onto Route 4 North. Continue 7.5 miles from light, through villages of Mechanicville and Stillwater. Office is 2.5 miles north of the Stillwater High School, on the right. From South and East: I-90 to I-787 North to the end in Cohoes (approx. 15 miles). At the end, right at light onto Route 32, north to village of Waterford. Left at 2nd light in Waterford onto Route 4, north. Stay on Route 4 north, approx. 6 miles to Mechanicville. Follow directions above. From the West: NYS Thruway to Exit 27 at Amsterdam. Take Route 67 East approx. 16 miles to Ballston Spa. Continue on Route 67 East, through Ballston Spa, cross over I-87 to Malta. At the Route 9 round-about go straight across Route 9 onto County Route 108 (Dunning St.). Go approx. 2 miles to intersection of Rt. 9P (Saratoga Lake straight ahead). Right onto Route 9P. Go approx. 3 miles. Right onto Route 423 (see big brown sign for Saratoga National Historical Park and National Veteran’s Cemetery). Continue over the hill, 6 miles to Route 4. Left onto Route 4 North. Office is ½ mile up on right. From the North: I-87 south to Exit 15 at Saratoga. Left off ramp onto Route 50 north. Right at light onto Wiebel Ave. Follow signs for “to Route 29/Schuylerville”. Go 2 miles to light, left onto Route 29 East. Continue 9 miles to Schuylerville. Right at light onto Route 4 south. Go through village of Schuylerville and continue 10 miles south (do not stop at first Saratoga Sod sign at big yellow house). Our office is six more miles south, past signs for Saratoga National Veteran’s Cemetery and National Park. Office is on the left.